Operational Security (OPSEC) which is the evaluation and control of any critical information that could be used against you by an adversary. The result of good OPSEC is the elimination or withholding of the most damaging information that your adversary has the ability to gather and understand how to use against you. OPSEC happens everyday. When you go on vacation and hold your mail and newspaper delivery, and use timers to turn your radio and lights on and off to make it appear that you are home, you are practicing good OPSEC. Here is a another example of OPSEC. A business contact I had worked as the Information Systems Director for the Department of Corrections in a populous state in the US. When he was at his office near the State Capitol, he wore a tie, nice shoes, and a business suit. But when he had to travel to the prisons, he would dress in jeans, tennis shoes, a faded work shirt, and would drive a State vehicle to and from the prison. He did not want the prisoners to know his appearance, or information about his personal car or license plate number. The reason is that he had intelligence that certain criminals said they were going to kidnap the Information System Director, as they thought he had access to the computer system and could lower their sentences by altering the computer files. Even though the computer system was set so that no one person could change anyone's sentence, the implications for this man and his family were the same. Some jobs, especially those dealing with criminals, require a lot of OPSEC in safeguarding your personal information. Once your information is compromised due to poor OPSEC, it is hard to ever regain it. This last year I had the privilege to read my father-in-law's letters to his wife while he was a sailor during WWII. Each letter was stamped as approved by a Navy censor, and never once did he reveal his location, or his ship's location. He would state that the weather is better here, not as cold, the harbor is beautiful, but never so much as a hint of his location. Even the return address on the envelope was from a State-side mailing address, as the Navy made sure their ships could not be tracked. The Navy coined the term "Loose Lips - Sinks Ships", and studying the US Military's OPSEC procedures is a great exercise for anyone. Step 1. Make a list of any critical information you have that can be used by an adversary. Step 2. Determine who your adversaries are. Step 3. Look at all the ways your critical information can be compromised. Step 4. Make an assessment and rate the items of information that are the most likely to be used by your adversary, and what countermeasures you can employ. Step 5. Consistently employ your countermeasures and other security for your most vulnerable assets, in priority order from the results of step 4. (a) My name, SSN, and DOB (used for identity theft and other purposes). (b) Bank and credit card information that could allow someone to fraudulently access my funds. (c) My bank statements that show all of the purchases I have made, and any groups I fund or support. (d) My garbage, which has old envelopes with their addresses still intact, and many personal items that reveal a wealth of information. (There was a group in Washington DC that would empty the garbage cans of powerful people, such as Henry Kissinger and others, and report the interesting items they found. Quite a find, and there are very few laws against taking someone's garbage.) The correct OPSEC for garbage is to [shred or] burn it, or take it to the landfill, instead of leaving it on the curb awaiting pickup. (f) Information on any real estate or other large assets I own. (g) A picture of what I look like. (h) The number of guns and ammo I own and where they are located. (i) The amount of food and other survival gear I have accumulated, and where they are located. (j) The interior layout of my home, and its contents. The Second Step is to determine who are your adversaries. Everyone has different circumstances, but a general rule that would help identify your adversaries is to determine the types of controversy you are involved in. You may need someone else to look at you objectively and tell you what are the controversial areas of your life that make you visible to predators. For the more controversy you create the more visible you become, and your controversy will draw those that oppose you. (2) Supporting and holding allegiance to various controversial groups in a public manner. (3) The purchase, display and use of military style guns in a region where people do not understand the need for the 2nd Amendment. (4) Openly using military grade equipment, such as dressing in fatigues or driving old Army trucks. (5) Campaigning for election to a political office, or influencing the political process in a significant way. (6) Having a national presence of some type, such as producing popular videos on YouTube, or having a popular radio talk show. (7) Having a lifestyle that is unacceptable to other people. An example would be the polygamous marriages practiced by the Fundamental Latter Day Saints. Just as your personal OPSEC assessment should always consider how your information is viewed at present, a good assessment should consider how your information may be used against you in the future. When you begin to engage in items of public controversy, the amount of public information you have revealed in the past will become critical. The best OPSEC is to keep amount of public information about you at the lowest possible level, as many people have so much information in the public domain that it is impossible to do anything about it once they become controversial. You should consider your public information and your potential adversaries before you become involved in a controversial area. The Third Step in developing your OPSEC assessment is to look at all of the ways your critical information can be compromised and used by the adversaries identified in step two. Using LinkedIn may be good for business, and having a FaceBook account may be good for friends, but they can be really bad OPSEC. What you look like, your views and outlooks, and a list of all of your friends and business contacts are available to anyone that can access your account. YouTube videos, web sites, and other Internet activity provide a tremendous amount of information that can direct attention to you and cause problems with your OPSEC. A good example of how critical information is compromised on the Internet is the case of the Hutaree Militia, who put their paramilitary training videos on YouTube. This raised their profile, and is probably the reason the Hutarees were infiltrated by a government agent. I don't think these people are more than talk, but their paramilitary training videos were very aggressive and probably frightened some people. The statements of the government infiltrator resulted with their arrests, even though they may have done nothing wrong. Paramilitary exercises are perfectly legal [in most jurisdictions], but should be done in secret as they can make you appear to be threatening to many people. You only have to "look" like you are dangerous to encounter problems, and good OPSEC should conceal all information of this type. Another way your personal information is compromised to a potential adversary is through your property deed information, which is posted by your tax assessor's office on the Internet. A lawyer or anyone else can look up your name, how many parcels of land you own and what they are worth, and what types of buildings or other improvements have been made. Not only can someone find out where you live but they can tell if your home is free and clear of all debts. Having a house that has a lot of equity can make you appear to be rich enough to be a target of a lawsuit. To protect yourself, you will need to obscure your public ownership information. To do this, you will have put the ownership of your home into a trust or partnership that hides your name on the tax records. This is crucial to avoiding a lawsuit, as lawyers routinely use the property assessor's tax records on the Internet to look for the assets of anyone their clients intend to sue. If you have a lot of known assets and the lawyer thinks he can win the case, the lawyer's proposed fee for his client will be to split the proceeds of the lawsuit that will come from the court's judgment against your assets. This way, it won't cost his client a dime to sue you. But if the public records do not reveal any ownership of real estate and other assets, the lawyer will demand his fee "up front" from his client before he will press a lawsuit against you. This will stop 99% of all lawsuits from ever being brought against you. Lawsuits are hardly ever brought against those that appear to be insolvent, because the lawyers and their clients are not likely to be able to recover their lawyer fees. A good example of real estate lost due to compromised OPSEC is the lawsuit brought against Operation Ranch Rescue, a controversial group that provided security to farmers along the Mexican border. One of the owners of Ranch Rescue had a large farm in Arizona, apparently listed in the owner's name. Ranch Rescue was sued on the behalf of illegal immigrants by the SPLC, who set the damages slightly greater than the assessed value of the owner's farm. Their lawsuit was successful, and the ranch was taken to satisfy the judgment the court laid on the owner. If the owner had practiced good OPSEC and had put his ranch in a trust, the outcome may have been different. I have a friend that is a wealthy real estate appraiser, and is often involved in local politics concerning the properties that he owns. He has been sued by county developers and other rascals for ridiculous reasons. He did not want to put his home in an irrevocable trust, so to protect his home from lawyers, he had a good friend file a large lien at the courthouse against his home for more than the property is worth. His friend also gave him a signed and undated quitclaim deed to terminate the lien, which the appraiser keeps in his safe. This makes him appear to have no equity in the property. When the appraiser wants to sell his home, he can file the signed quitclaim deed at the courthouse which will void the lien against the property at any time. None of the appraiser's vehicles are titled in his name, but are titled in his company's name, which is not directly tied to him. His other assets are handled the same way. When a lawyer researches the appraiser's assets, he appears to be insolvent, and so is protected from almost all lawsuits. Using a temporary lien would be one type of OPSEC when you cannot hide your ownership. Some of the best protection of your information from your adversaries is to obscure it with disinformation. Even friends that you trust, combined with guns, can be deadly. Those who are friends today can be your enemies tomorrow, and report to others your level of gun ownership, which will compromise your OPSEC. Consider the Branch Davidians in Waco Texas, who were first brought to attention of law enforcement by the complaints of a former member. This was followed by a damaging series of articles written by the local newspaper. Another incident that raised their profile was their mail order gun parts business. One package they ordered by US Mail had dummy hand grenades and other firearm parts. The carton was somehow opened at the Post Office, and law enforcement was notified. This incident, as well as the large number of guns the Branch Davidians were legally purchasing, and the complaints from neighbors of the sound of guns being fired on their property, brought them to the attention of the ATF. The final lapse of OPSEC was purchasing the legal-to-own [and BATF-approved] "Hellfire" trigger, which made their semi-automatic guns sound like they are fully automatic. The legal basis for the ATF raid that ended with the death of the Branch Davidians was that they had "possibly" not paid a $200 license fee for having a unverified fully automatic weapon on their property. I don't believe the Branch Davidians ever broke a law, but their OPSEC was terrible and is what made them the target of the ATF. Better OPSEC for the Branch Davidians would have been to rent a location for the gun parts business away from their compound, and to test fire their guns at a recognized rifle range. No outsider should ever have known that guns were on their property. If guns had not been involved, at most they would have been raided by Child Protective Services and not the ATF, and the outcome would have been much different. Openly purchasing large amounts of guns and firing a lot of ammo on your property is perfectly legal, but a great way to compromise your OPSEC. No one, not even your closest friends, should know about all of your firearms. "Bump-firing" your semi-automatic rifle at fully automatic speeds is legal and a lot of fun, but who is listening to you shoot? What type of acoustic signature are you creating? Better yet, who are you making afraid? The neighbors that are afraid of you could be the "Human Intelligence" that law enforcement will use to investigate you. You need to appear harmless to everyone, especially your neighbors. I know one person who claims to be a non-violent Mennonite to avoid any indication that he has a large gun collection. Any target practicing he does is just one shot at a time, to slowly zero in his "hunting" rifle. There is absolutely no need for anyone to rapidly fire a full 40 round magazine. It is just a waste of ammo, and reveals the size of the magazines that you have. Your best OPSEC is to never openly reveal the types or numbers of guns that you have through the sounds they make, or as some would say: "Never pull out a gun unless you are going to use it." For once you make known to the world what types of guns you have, your adversaries will counter with something better that will neutralize your advantage. Your OPSEC is compromised when you do things that attract attention to yourself, such as wearing camouflage fatigues outside of hunting season, painting your vehicle OD green or camouflage, or stringing up miles of concertina wire around your property. When I see the ultimate mondo security gate, I remember what Jeff Goldblum [as "Dr. Ian Malcolm"] asked about the massive gate at Jurassic Park: "What have they got in there, King Kong?" A large security gate will make your neighbors wonder what you are hiding up there. A better solution is to install steel cables or hardened steel chains to run behind each gate that are hidden when not in use, but can be pulled taut and locked as needed. Bulking up your home with visible guard towers, LP/OPs, trip wires and sand bags is such poor OPSEC as to destroy everything you are trying to do. Security items that are visible to others makes you more vulnerable because it raises your profile. A good solution for your retreat security improvements is that they provide double duty, one that is perfectly acceptable and normal for today, and one that is meant for when the balloon goes up. For a LP/OP, consider building a kid's "dream tree house", complete with a "fun field telephone" system connected to the house for emergencies. Instead of concertina wire, put electrified barbed wire on top of your fences with a separate "100 mile fence charger" for each strand of wire. The amount of electricity is not obvious, at least until you touch it. For trip wires, consider using High Tensile Electric wires. Not only do they trip, they can shock the pee out of you, as well as keeping your goats and other animals in the right area. Raising animals gives you a good reason for a lot of fencing in various places. Our last line of electric fence surrounding our house may give us protection from intruders after TEOTWAWKI, but right now it keeps the sheep and cows off our back porch. And our Great Pyrenees dogs provide protection from coyotes, as well as handling people that walk by our property. I even got challenged by my 1,500 lb bull one night while I was walking back from the barn. Once he knew it was me, he left me alone, but I would feel sorry for anyone else that tried to run. Our retreat security preparations are natural and out in the open, yet good OPSEC is to not mention any dual purpose they may have, or say anything about them at all. The correct OPSEC for your radio communication system (more precisely termed COMSEC) will require careful planning. I think it is important that you hide or make invisible the shortwave and other types of radio antennas on your property so they cannot be confiscated. If you use only passive radio receivers on your property and not transmitters, then you will not have to energize your antenna wires, and they will be safe for human contact. This opens a lot of possibilities. A bare wire insulated at both ends that secures a flag pole or windmill, or a wire between two buildings that supports bird house gourds, or perhaps a section of electric fencing that is never charged, these may be good camouflaged passive antennas. Active radio transmitters are different, as their transmission location is compromised every time they are used. Good OPSEC requires that any radio transmitters be mobile and all transmissions are made in different places away from your residence. If for some reason shortwave and other types of radio transmitters are banned and you have been transmitting for some time from your home, it would be easy through radio detection and triangulation to pre-determine where all of the radio transmitters are located before the ban was made public. If you want to keep your transmitter, use it away from your home. Project Echelon is a signals intelligence network operated by the US, UK, Canada, Australia, and New Zealand. Echelon has the ability to monitor global communication, including cell phone conversations. Echelon may help identify the movements of people that the government has an interest in following, as it identifies certain types of spoken content. If your cell phone conversations frequently include words such as "jihad", or "nuclear bomb", you might end up on their list. Watch what you say on your cell phone, even in jest. No wireless communication is ever secure, and any information you release over a wireless transmitter should be considered compromised. I don't think I am enough of a target for Echelon to monitor me, but I have seen a demonstration of the Verizon GPS tracking service called "Field Force Manager" that Verizon offers its corporate customers. If a company issues their employees a Verizon cell phone, Verizon has a new service that allows the company to see on a map where these cell phones are being used. If the cell phone is turned on and you drive a long distance, the map will show your route, your speed, and where you were at each moment of the day. This information is stored, and the company can call up any previous day's GPS locations and movements. It reminds me of a song: "There's an eye, a-watching you...". I don't want Verizon or anyone to track my movements. I always leave my cell phone turned off except when I call out on it. To be perfectly safe, I would need to pull the battery out of the phone, or get rid of it entirely. We had a friend with a domestic situation, and he discovered that a private investigator had placed a cell phone in his car, apparently to track his movements. He gave this cell phone to someone he met at a truck stop going the other direction, and told him to make all of the calls he wanted. For his own use, he bought a "throw-away" cell phone with pre-paid phone card minutes, for which he paid cash at Walgreen's. it is completely untraceable. The Fourth Step of an OPSEC plan is to rate a list of the most damaging information I have that could be used by my adversaries. First on my list is anything that would get me killed, either before or after a collapse of society. The knowledge that your home has large number of guns or precious metals can invite a home invasion with deadly results. What would you tell a robber who has a gun at your wife's temple when he asks you where your guns, gold, or survival food is stored? I would put my OPSEC for concealing information about my guns, precious metals, or survival items at the top of my list. My next most valuable information would be my house and property. For this, you want to put your property into a trust, so that you do not show up as the owner when the property records are searched by a lawyer. I would also suggest an unlisted telephone number, as anyone can find your home address listed in the phone book. I had a Bible prison ministry for a while, and some of the prisoners would call me once they got out of jail. Some were saved, but most were not very repentant, and quite a few of them were dangerous. I finally realized that any of these former prisoners that knew I went to church on a regular basis could rob my house while I was at worship, but only if they knew my address. I unlisted my number, and have since moved to a new address. It is very wise not to have a listed phone number, as this is the number one way a criminal can determine your address. Your home says a lot about you, and is your sanctuary and castle. You don't want anyone that is a criminal to know the location of your home or its contents. One of the most successful WWII spies for the Allies in France survived because kept his address a secret. He was never caught by the Germans because he changed his appearance often, paid his rent in cash, and he never, ever brought anyone to his home or revealed where he lived. Likewise the information of the contents of your home should not be revealed. King Hezekiah in 2nd Kings 20:12-19 proudly displayed his treasures to the Babylonian diplomats, thinking they were harmless. Babylon later attacked Jerusalem, and took all of the gold and other treasures, probably because they knew how much wealth Hezekiah had. I have a friend that competes in mounted shooting, which is the sport of shooting from horseback for competition. During a short period of time while they were gone, someone stole all of their guns, even the ones that were somewhat hidden. Only someone that knew the contents of their home could have done this. A lack of OPSEC, such as opening up your home to large groups of people that you don't know, can have negative results. I don't have to hide from the world to have good OPSEC. I have various friends that visit our home, and we worship at each other's homes, but for strangers, we do not let them see the inside of our residence, as the layout and contents of our home is personal information. The information that is last on my priority list is the "hard to get" information with less value that could only be a problem if something changed. For example if I decided to run for public office, or tried to get a high security clearance for a sensitive job, current records and associations, which are not a problem now, would be scrutinized. Changes to our legal system that might criminalize items in the future that are now legal (such as gun ownership, the possession of gold, using unpasteurized milk, etc) are good reasons to have a good OPSEC plan. One item of information you should consider is your bank records. Any person or any government agency that can access your bank records can find everything you have purchased, and what groups or programs you support with your donations. Some people will deal purely in cash, but that also raises a red flag. The way I handle it is to buy all of the regular, "conformity" items with my debit card or by check. For anything that may in the future be a problem, such as buying raw milk from an unlicensed dairy (i.e. the farmer down the street), I always pay in cash. That way, I have a "public" persona that appears to be harmless, while my cash-based private life hides my secret consumption of various semi-legal dairy products. The benefits of raw milk are significant, and it should not be up to some bureaucrat to determine my health. But as time goes on, even the items that keep us healthy may be banned under Codex Alimentarius. Another item that may be banned in the future is the ownership of gold. In 1934, Franklin Roosevelt passed the Gold Reserve Act, which made the private ownership of gold [bullion and most coins] a criminal offense. It could happen again. If you are buying gold, guns, or anything that is legal now but may be a crime in the future, then it is critical that you use cash and not create any information "paper trail" concerning your purchases. It is good to do an routine evaluation of how much compromised public information you have. On occasion, I try to "find myself" on the Internet to see how much information about me is out there. I go to Google and type in my full name surrounded by "double quotes". This makes Google search for the exact string of words in quotes, and sometimes I find public records I did not know I had. Veromi.net is another way investigators find people. I also type in all or part of my street address inside the double quotes, and then leave the city and state outside the quotes. This loosens up the match on Google, and gives a better result. I do the same for my P.O. Boxes, and my unlisted land line phone number and my cell phone number. It is surprising when you find your unlisted phone numbers on the Internet. The reason I check my name, address and phone information on the web is to make sure they are not compromised, or posted by some company that I do business with. A few years ago I developed some Internet software that became popular. On the Authorship page, I stupidly put my name and old home address, and there has been no way to get this information off the Internet, even now. At my job, I had to fire an unbalanced person, who has since kept tabs on me, and has easily found this old address. For good OPSEC, when I moved my family to our new address, I made sure no connection between the old and new address existed. I forwarded all of my street mail to a P.O. Box at my old location's Post Office. I opened a new P.O. Box at my new location, and did not give a forwarding address. Next, I selectively notified friends, the electric company, and very few others of my new P.O. Box. Nothing else got forwarded. This also got rid of a lot of junk mail. And I did not get a street mailbox at my new home for two years. The next item in building my OPSEC for my new home was to develop a bullet proof solution for having a street address. Various government agencies, such as our state's driver's license section, require that you have a valid "911" home street address and not a post office box. Some home deliveries and online purchases require a valid street address. Since we purchased raw land that did not have a residence, I had to tell the 911 section at our County where my new home would be located. I told the officials that we were building our house down the road near the paddock, past the barn. The 911office assigned our street number based on the distance from the beginning of the street to where they thought our house would be built. For example, if your 911 address is 1250 Jones Road, your house is located 1.25 miles from the beginning of Jones Road. Each address is based on the distance from the beginning of the road. Anyone using a GPS address locator to find your physical street address will go this exact distance down your road. So after I received my 911 address, I built a large shop building near the paddock, where we lived while we built our house. I put the 911 street number they assigned on the shop. Then I built my driveway about ¼ of a mile up the road from the barn, and put the house even further away up from the shop up on a hill where it is not easily visible. The result has been that whenever the census takers, the county appraiser, US Mail, UPS, FedEx or anyone that uses a GPS locator for my 911 address comes to my street address, they always go to the shop building. If they knock on the door at the shop, they think no one is at home. All deliveries and mail are left at the shop. I have never had anyone I did not know come to my real home, as my real home has no street address, only the shop does. Your local 911 group will assign a latitude and longitude to your known street address, which Google uses to puts a pointer right on top of your home. Go to Google Maps, or you can download their Google Earth package. Enter in your complete street address, and Google will put a crosshair right on top of your home. The latitude and longitude coordinates for your home were also collected by the US Census Bureau. The only downside to not having a valid 911 address that points to your real home's location is that when an ambulance is called, it will go to the wrong place. In this rare emergency I will just send someone to flag them down to go to the correct location. The Last Step in my OPSEC Plan is to continuously employ countermeasures to safeguard the most valuable information I have that is most likely to be accessed by my adversaries. I have listed quite a few of our countermeasures already. One final countermeasure that everyone should have is to encrypt your computer's wireless router, otherwise anyone that drives by your house with a laptop can access your computer system. Even with encryption, your emails, Google searches, and web sites that you visit are recorded as all of your Internet history is kept on file at your Internet Service Provider and can be used by a government agency at anytime. Good OPSEC would be to use the Tor Anonymity Network or other means to control the Internet information you create. The final countermeasure is to go back through the five steps of OPSEC assessment on a regular basis, namely, identify your information, consider your adversaries or threats, analyze your vulnerabilities, assess or rate your risks from high to low, and employ countermeasures. As your situation changes, so will your OPSEC. Completing and acting on a regularly scheduled OPSEC assessment may save your life. Wheat for Survival–How Do You Get Started? It’s a great little primer on the different kinds of wheat as well as how to store and use it. An excerpt is below. There are few foods and crops that homesteaders consider as essential as wheat. In these days of pasty loaves of over processed “store-bought” bread, the mere phrase “whole wheat” evokes thoughts of wholesomeness, healthfulness, and quality. It shouldn’t be too surprising to learn that wheat is the most important and widely-grown grain crop in the world. It is also the best type of grain to use for bread making — and this comes from an old country boy who has eaten his share of bread! Indeed, this life-giving grain can be made into hundreds of nutritious breads and other foods. It is deserving of that number one spot on the food scale. It is equally deserving of a prominent spot in the homesteader’s larder. One of the sources for purchasing wheat mentioned in the article is Emergency Essentials. Click the Superpails link on their site. You can also buy organic wheat from Miller’s Grain House. Mention DestinySurvival when you order. For an excellent little book that thoroughly covers the subject of wheat, click on the image of How to Live on Wheat below and order from Amazon.com. To hear my interview with John Hill, the book’s author, listen to the February 3, 2011 DestinySurvival Radio. Wash and soak 5-6 hours in cold water pickles, Drain. 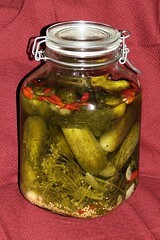 Into each dry sterilized jar place 1-2 heads pickling dill, 1-4 buds garlic. This is the basic recipe, but feel free to add small quantities of flavorings. Stand cucumber in jar upright. Bring to boil water, pickling salt, vinegar and sugar, set aside to cool to room temp. Pour brine over pickles to cover, leaving 3/4″ head space. Cover with lids and screw on lightly, but do not tighten. Place jars in a pan to collect drippings that may spill over during early vigorous curing period and let stand at room temperature. About slightly warmer 75 to 80 degrees 3-4 days, by which time the bubbling should cease. Add extra brine to any jar in which cucumbers are not submerged. Wipe jar and lids with clean cloth and seal tightly. Store in cold cellar or fridge to preserve crispness. As this is my first foray into the brined and fermented vegetable world, I have made this recipe as simple as possible. You certainly can customize this to your taste. Flashlights, batteries and the quest for light. Been thinking about doing this thread for a while and MIL-DOT got me into the mood with his recent flashlight thread. So, I'm a flashaholic. No it's not what you think. A flashaholic is someone who collects, builds, modifies or simply appreciates a good flashlight. Basically we're portable, handheld lighting nerds. There are some good forums around and my favourite is CPF (Candlepowerforums). I have around 30 in my collection that range in price from $5 to over $200. Some are insanely bright, some are insanely small, some are just there to be used and abused. So, with that said I've got a little to say on the subject for people wanting a little advice. I'll keep this basic as there's a lot on the subject that could be said but would just confuse people. First, not all flashlights are created equal. There are many brands out there that you might know of and think they are great, but they're not. Maglite once ruled the roost and while they still make a good product, you can buy cheaper lights that are better. I have quite a few maglites but none of them are stock and the dimmest one still puts out 400 lumens (stock about 100 lumens). They also make great self defense objects that the cops won't bust you on if you have one in the car. In recent years there have been tremendous steps in the technological development of the LEDs (light emitting diodes) used in most flashlights and the electronics used to drive them. If you spend around $50-$60 on any of the 2AA or CR123 lights offered by quality makers (yes most of them are Chinese, but they're pretty good) you will get a light capable of emitting a stable and constant light of around 80-100 lumens for 5-6 hours on ni-mh batteries. An older style 4D incan flashlight would give the initial 80ish lumens but the batteries would be virtually flat within two-three hours, as would be the output. When selecting a flashlight, look for something that is current regulated and will take not only alkalines, but also ni-mh and lithium primaries. 4Sevens - make a variety of small to medium sized lights that take most batteries and have stylish yet rugged design. Their Quark series is good value for money and I highly recommend them. Fenix - also make a variety of small to medium lights, but also make several jaw dropping lumen monsters. Their TK60 is capable of 800 otf lumens for 4 hours of 4 ni-mh D's. Jet Beam - make some seriously nice looking flashlights. They have a fairly good reputation but I don't own any myself so look at some reviews. Zebralight - most famous for their early headlamps, now make some really nice EDC lights that have fantastic regulation that is quite astonishing. Their SC51 will put out 30 lumens off a single AA for around 9 hours. Surefire - These are the light that really started the small, but powerful flashlight revolution. They are more expensive than the Chinese brands (duh) but the build quality and reliability are second to none. Look, there's loads more out there so just let google be your friend, don't be offended if I missed your favourite brand. Second, not all batteries are created equal either. Alkalines are by far the most popular but also come with a variety of flaws, not the least of which is they tend to leak after a while, ruining whatever they are in. Alkalines...mmmm...use these for emergencies only. They will leak if left unattended, and especially in hot environments. They also don't have great energy density and are not suitable for high drain devices. Ni-mh (nickel-metal hydride) batteries can deliver outstanding performance in high drain devices. Though not all ni-mh batteries are of the same calibre. For myself, I have found that Sanyo Eneloops are by far the best ni-mh battery made. They are LSD (low self discharge) and will store around 80% of their power after more than a year of being left unused. They are very resiliant and last and last. I've had some I charge weekly for a few years now and they still perform as good as new. Most ni-mh batteries are flat in less than six months. Combined with a smart-charger, eneloops are a brilliant way to light up the dark and save the environment as they can be charged up to 1,000 times (1,500 for the newer ones). A smart charger will charge each cell individually and they also have a discharge function which discharges the batteries right down to erase any memory they might get. This should be done once every 20 or so charges. Lithium batteries have a tremendous amount of energy density and are around 1/3 lighter than alkalines, they don't leak and the shelf life goes beyond a decade. These are the best choice if you want to leave a flashlight in the glovebox or kitchen drawer for that time when you really need to have a flashlight and have it work. There's nothing worse than needing something only to find it's dead. Stick to the known brands as a lot of the cheap Chinese batteries are not as well made as some of the better known brands. Buying in bulk you can get quality lithiums fairly cheap. Lithiums batteries come in many sizes and most, but not all flashlights will accept them. Check the manufacturers warning on battery types before purchasing a flashlight. There are also li-ion batteries that are rechargable but have to be cared for and should really be left alone unless you really learn how to use and care for them properly. They also require a different charger to that used for ni-mh. Third, not all beams are equal. Some flashlights are designed for throw. That is, they are designed to send the light a long way, usually in a narrow angled beam. Some flashlights are designed to have a flood beam. That means they spread the light out a lot more and don't shine as far. This beam is ideal for close work and such. Still there are some which are designed somewhere between the two. They will throw reasonably well, while also having a nice spread of light. This type of light is the most suitable for 90% of what you will use a flashlight for. Lights that throw usually have what's called a smooth reflector, in that the surface of the reflector is a smooth mirror finish that directs the light nearly straight out the lens for maximum distance. Lights that are floody often, but not always, have a textured refelctor, often referred to as 'orange peel' as it has a similar appearance to the skin of an orange. The textured surface scatters the light more and gives a smoother, more diffuse beam. 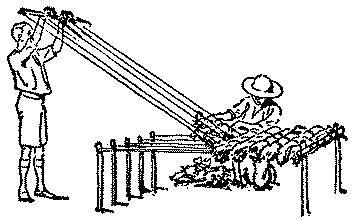 This type of beam is usually the most pleasing to use for day to day tasks. Modes - This should be up there with the flashlights, but it's such a vast subject I'll give it it's own little section here. Many lights these days come with modes. That is they have more than one output changed by a variety of functions depending on how the manufacturer designed the light's switch and electronics. Most lights with modes have a broad range of output from as low as a super low 0.2 lumens up to a whopping 2000+ lumens in some of the big hitters. The idea is that not all outputs are suitable for all conditions. You don't want 500 lumens for reading a book while camping, you don't want 10 lumens for search and rescue. Modes also give you the opportunity to find a personal sweet spot between output and runtime. Less output = more runtime and more output = less runtime. Some lights have very complicated UI's (user interface) that require some careful reading of the instructions and a little practice to get a good hold on how the light operates. Some of my lights my wife won't even touch because of this. Choosing your flashlights (yes you do need more than one, two is one and one is none, blah, blah, just get more than one) is something you can do by trial and error, or go to one of the many forums on flashlights and do some reading and ask questions. One of our family favorite recipes that we always have ingredients on hand for is Alton Brown's Granola. If I had it my way Alton would somehow magically end up with our family if TEOTWAWKI happened. If you're not familiar with Alton Brown, he has a show on the Food Network called Good Eats which is very helpful to those starting out in the kitchen. I've learned lots of tricks and tips from Alton. Also, there is an episode where he makes his own makeshift smoker to make bacon. Now that is a cooking show. One of the basic things we store are oats. Oats are high in soluble fiber and thus help in lowering bad cholesterol-LDL, also the fiber helps with the digestive system as well. Oats can be used as extenders in cooking -- in meat loaf, for example, or I've even heard of it being used in taco meat. Oats can also be used as a substitute for portions of flour in baking. Or it can be eaten the best way, as a big bowl of oatmeal with brown sugar and cinnamon--at least that's my favorite way. Since oats are so useful and have a long shelf life (8-10 years under ideal conditions) they are ideal for food storage. Now on to the granola. Granola is great way to use up some oats in your rotation. We eat granola plain as a snack, with yogurt, as cereal, or on ice cream from time to time. Even my 2 year old loves it....and he's pretty picky. It is a pretty easy and delicious treat that always goes fast. Crunchy, sweet, with a cornucopia of delicious flavors - maple syrup, nuts, coconut, fruit - it is simply amazing. I would offer an expiration date, but this granola has never lasted more than 2 weeks at our house. We usually double the batch too. Through a circuitous bit of aimless interweb searching I came across a huge list of downloadable urban homesteading/gardening/survivalist manuals on a site called hardcorepreppers.com. Unfortunately, this site is so popular that it seems to be down every time I've checked. But thanks to Google's caching feature I was able to access a list of those documents. Here's a curated set of just a few of those links (through the letter "f") that I found interesting. I can't vouch for the reliability of any of this information but at least it's entertaining. And if you have any other favorite free e-book sources please leave a link in the comments. At some point I'll direct the Root Simple staff to add these and more to our resource page. I thought I would share my PDF files with anyone that needs some reading material. I'll be adding even more over the next few days and weeks as I keep converting my files into PDFs I will post them here in batches. I don't make any money by sharing these or soliciting downloads. I'm hosting these purely as a way to give you guys some resources. In the event of some kind of pandemic/epidemic, you should be prepared to quarantine yourself in your home. Lets discuss a few thing you should have at hand. Being that we are preppers, I am not going to go into food and water preps as you should already have these on hand. Avoid contact with others. This is number one for obvious reasons. The less contact you have with others the better. Consider everybody as infected. Even family members. If you or your family have prolonged going to work, any one of you could be carrying the infection. Avoid hugs and kisses with your family for at least 2 weeks to be sure of negative infection. You may consider wearing gloves and mask around the house if you are not sure. If somebody in the house is infected, that person needs to be segregated to a room of the house and that room needs to be duct taped closed and opened only to pass necessary items through then see rule #6. Rubber gloves. Infectious disease can live on porous items for up wards of 72 hrs. Best not to trust this estimate. Consider all items coming in from the outside to be contaminated and should be washed with anti bacterial soap or a chlorine mix before handling with bare hands. Therefore, any item you pick up after the emergency starts need to be handled accordingly. N100 Masks. Do not underestimate airborne particles. These will be the number one infection transmission method and should be mitigated. If your are using a evaporative cooler, turn it off and seal your vents with duct tape. Think about a window mount air conditioner instead. Seal air leaks in your home. All it takes is one particle of ionfectious material to doom your whole family. Since you will be indoors with not alot to do, do this. Never touch your face with your hands. Your hands by default will be the most likely area of your body to contain infected debris. All common items in the house should be disinfected after use regardless if anybody is sick. The kitchen and bathrooms should be meticulously cleaned after use. Every use. If you are able to obtain Flu mitigation medication such as Tami-flu, get those now. Be sure to have entire courses of meds for every member of your family. Your neighbors are not your friends. Do not watch their kids for them. Do not invite them in. Talk to them through windows. Don't even open the door to them. If they ask to talk with you outside or insist, tell them you are sick. That should end any unwanted conversations quickly. If a family member dies in quarantine, Seal off the room until professionals can deal with it. Don't risk it. If you decide to take matters into your own hands, Wear long pants and long sleeves. Tuck your sleeves into your gloves. Dig your grave prior to moving the body. Spray the areas of the body you intend to touch with your bleach solution and wait 10 minutes before touching the body. Avoid touching the torso and head of the deceased person and only touch the disinfected extremities. Disinfect you clothing and shower after the operation is complete. Do not wait for the government to shut down the schools before you pull your out!!!! The government is historically reactive. Be proactive. While discussing these procedures with your neighbors may seem like a good idea, don't make it sound like your home is a safe zone or you will be invaded. Keep your infection control on the down low to minimize friendly or unfriendly visits from your neighbors. Never, ever tell them you have meds either.